Sagir Adam, 21, survived the weekend attack on his agricultural college in north-eastern Nigeria when suspected Islamist militants killed about 50 students sleeping in their dormitory. “It was a night of horror,” he told me, struggling to find words to describe what happened. Gunmen in military uniform in a convoy of two vehicles and motorcycles stormed the college at about 01:00 – a time when students are asleep in their hostels, surrounded by complete darkness. Yobe State College of Agriculture is down the road from Gujba village. The entrance is fenced but the rest of the campus merges with the bush that stretches from Yobe state into the deep forests of neighbouring Borno state – the stronghold of the Islamist group Boko Haram. Its fighters regard schools as a symbol of Western culture. The group’s name translates as “Western education is forbidden”. Despite the attack, and others like it, Mr Adam wants to go back to the college and continue with his studies as he believes an education will help him find a job. But he is now back in his home town of Nguru – a four-and-a-half-hour bus journey from Gujba – and his parents will never let him go back to any school as long as the danger of Boko Haram exists. His father has told him that his priority is to stay alive. Yobe state is one of the poorest and educationally disadvantaged states of Nigeria – it is certainly the least developed state in the north-east. Sharing a border with Niger to the north, it is arid and its inhabitants are largely farmers. But farming is becoming more difficult or impossible as a result of growing desert encroachment. Many tertiary students I have spoken to in Yobe’s major towns – Damaturu, Geidam, Nguru, Gashua and Potiskum – say their parents have asked them to return home for security reasons. 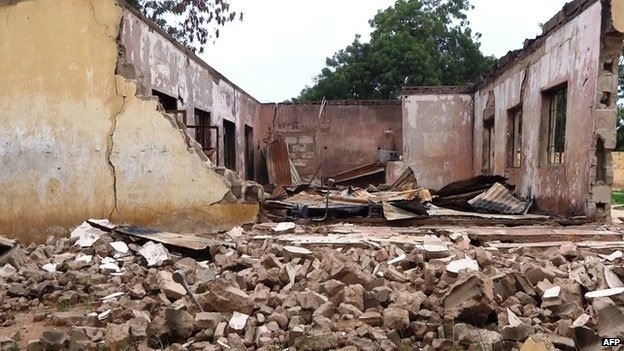 Three states in north-eastern Nigeria have been under a state of emergency since May when a security operation was launched against Boko Haram. Many of the militants left their bases and violence initially fell, but revenge attacks quickly followed – several on schools in Yobe. “I always live imagining I can be killed. No-one is sure of what will happen,” Potiskum resident Kadai Musa, who has three wives and 15 children, told the BBC about life under the state of emergency. He says none of his children have gone to school in the last six months because of fears of further attacks. “We no longer care about anything else except to live and see the next day,” he says. Agricultural lecturer Bukar Mustapha can testify to shrinking class sizes. He says the weekend attack may mean teaching unions will refuse to allow staff to go back into classrooms until security can be guaranteed. But there is no security in the remote area around Gujba, a village along a major road linking Yobe with Adamawa state. Apart from some mud houses sparsely strewn over an area the size of two football pitches, Yobe State College of Agriculture is the only prominent feature of Gujba. At the gate of the college there is a security guard, who is usually untrained and armed with a torch light and a bow and arrows. In the early hours of Sunday when the gunmen arrived, they demanded that the night guard show them the hostels for male and female students. He prevaricated, saying that most of the students had gone home for the weekend – only pointing out one dormitory. Other students awoke when they heard the shooting – the sleeping students were killed with guns and a hand-held saw. Some students died running, while others were killed after being mistaken for bandits by villagers as they fled. The gunfire lasted for four hours. Hostels were burnt, the college’s shops ransacked. No security agents intervened during this time and the militants eventually left with the college ambulance. When dawn broke, dead bodies could be seen dotted around the hostel area. All day, wailing and tearful relatives hung around the morgue in the state capital Damaturu, 30km (18 miles) north of Gujba, where the dead bodies had been conveyed. The two sons of Ishaku Lawan, a 60-year-old driver, survived the dorm attack. “I am grateful to Allah my sons survived,” he told the BBC. 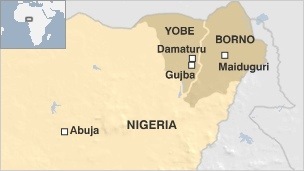 Most Yobe residents bemoan this precarious security situation. They have been living with on-and-off curfews for more than a year. Motorcycles were banned because of the many drive-by shootings – a trademark of Boko Haram killings. Thousands of young men who earned their living running motorbike taxis are out of work. But now life is more risky than ever. Muhammed Abba, a civil servant in Damaturu, has visited his mother in Maiduguri, in Borno state, every weekend for more than a decade. But in the last two months he has been unable to make the journey, which takes about an hour. 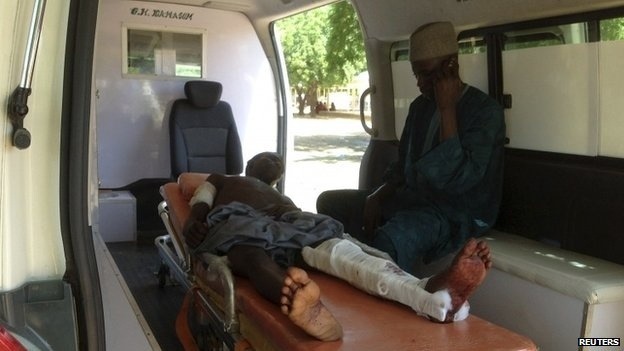 “In recent days, gunmen of Boko Haram have been blocking the road and slaughtering commuters. They killed over 100 recently,” he said. “They normally operate in the evenings and early mornings. My mum begged me not to come and see her because of the risk involved. For now schools will officially remain open in Yobe, but they are likely to be abandoned as Boko Haram increasingly targets them. But Mr Lawan is desperate for his sons – Muhammed, 23, and Fusami, 25 – to get an education. “I want my sons to be educated. I am 60 and a driver – I don’t want my sons to be like me. I will look for a school in a state where there is security,” he said. His meagre driver’s salary means he will struggle financially, but he says it will be worth it to send his sons to any school outside Yobe state.